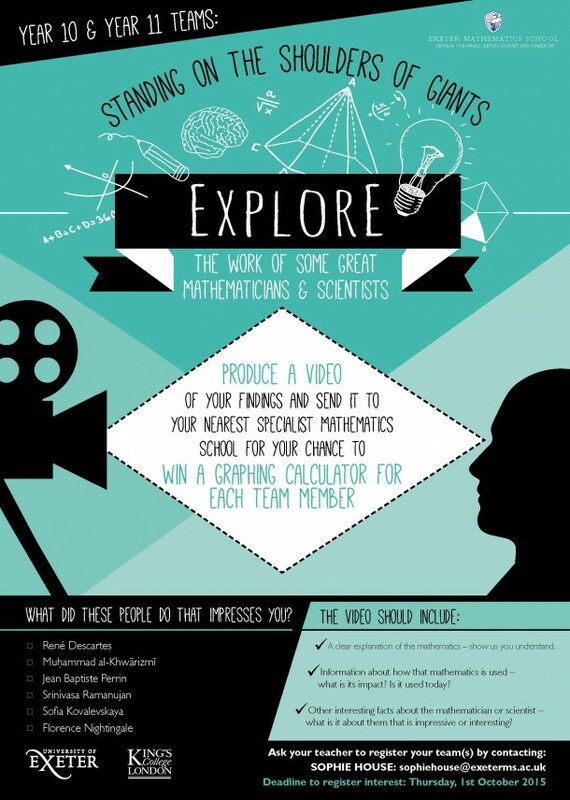 Following the success of previous years, Exeter Mathematics School (EMS) will be organising a mathematics video competition in collaboration with King’s College London Mathematics School (KCLMS). The competition is open to Years 10 and 11 students with teams of 3 – 4 students and schools may enter more than one team should you wish. Winning teams from entries submitted to both EMS and KCLMS will be invited to an award ceremony in London, where each student will be presented with a graphing calculator, and will be featured on our website and social media pages. Teams need to be register by the Thursday, 1st October, see Miss Whitehouse to do this.